Download Hop Press as a PDF! 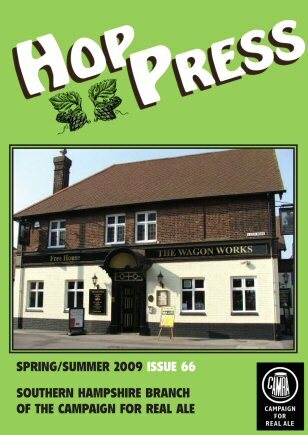 Hop Press as printed in pdf format. This is a 3.5MB download (includes most of the adverts & a misplaced clue in the crossword!). April the third brought a new era for Eastleigh's cask ale drinkers, with the opening of the town's first Wetherspoon pub. 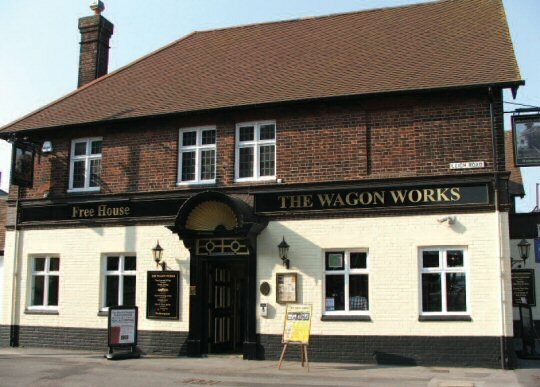 Our cover picture shows the new venture, recognisable of course to many as the Home Tavern, but now operating as the Wagon Works — alluding to Eastleigh's historic past as a railway town. Reportedly, £640,000 pounds was spent on a complete revamp of the building and a layout in the familiar Wetherspoon house style. If the opening night crowds are anything to go on such expenditure could quickly be recouped, even with the well publicised Wetherspoon 'cheap beer' policy. The entire stillage of real ales sold out on the opening day, by day two only three cask beers were back on pending a new delivery! The pub manager said "We never anticipated such a demand..." possibly the understatement of the month. Meanwhile, it is rumoured that another nearby local pub reduced some beer prices the next day in response to the opening, and are applying for 9am opening to match their new rivals. [I will interject here a small personal criticism, of the railway theme. 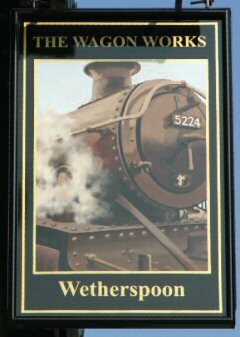 It is very surprising, and disappointing that the pub signs and much of the interior theme did not use Eastleigh built engines. The signs in particular do not even feature a Southern Railway engine, it is a Swindon built GWR freight loco used for hauling coal in South Wales. Now another occasion, unusually, to include a picture in the Editorial section. 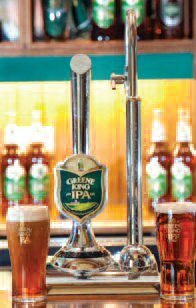 The Greene King national brewing/pub company issued a press release at the start of April (not the first, surprisingly) which, whilst in passing extolling the sales increases and growth of the real ale market place, announced what they describe as "a cask beer revolution" — a new beer dispense system. "...a new high-tech cask beer engine, which gives beer lovers a choice of styles for their favourite pint – 'smooth and creamy' or 'clean and crisp'." "Taking inspiration from the revolution in coffee, where choice is the name of the game, the stylish Cask Revolution font is now being rolled out to pubs across the country — for the serving of fresh, crafted, award winning Greene King IPA." And, in the picture, here it is. Why, just to dispense beer with or without a 'tight head,' should require such a chrome edifice when a simple request to slacken or tighten the sparkler on a conventional hand pump would serve as well, is beyond us. Now to Mr Stephen Oliver. Mr Oliver, a name some may recognise, is the Managing Director of the Marston's Beer Company and is a frequent, outspoken, columnist in the Morning Advertiser , the licensed trade's newspaper. On Friday, March thirteenth he must have woken in a particularly splenetic mood for he produced a rant against CAMRA and our membership that was almost unbelievable for its bigotry, bile and malice. 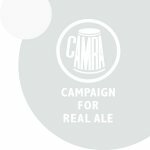 "... You'd think that the beardy weirdies of the Campaign for Real Ale (CAMRA) would be happy that their favourite brew is seemingly coming to the rescue of at least part of the British pub scene. But no! Apparently, according to the Malcontents of CAMRA's sandal-clad, whisker-stroking stormtroopers a guest ale's not a guest ale unless it comes from some oddball brewery down a country lane and is served with bits in it under a name like Knackered Old Cripplecock." "Bizarrely, though, some licensees seem to think that they should have an even wider choice, egged on of course by the itinerant CAMRA bunch that go promiscuously from pub to pub, looking for their next eclectic pint brewed in a cupboard with dubious benefit of progressive beer duty. They're a gobby lot, the beardies. Holding up the glass, opining on the beer before them, more often than not talking rubbish about ingredients and how it's brewed. Licensees should be aware [sic, beware? Ed.] of kowtowing to them. .. it would be a tragedy if the hobbits took over the show." There's more but you get the general tenor. Clearly, the clean-shaven Mr Oliver must have had some awful childhood experience of a hairy nanny perhaps! There was an open day at the Keystone Brewery on January 30th. In charge of showing visitors around was Alasdair Large who, together with his wife Charlotte, founded the brewery in 2006. Tour guide is just one of the jobs that Alasdair performs, alongside delivering the beer, sterilising the bottles, cleaning the floors, not to mention brewing the beer. Charlotte, who is better known as Charlie, is in charge of marketing and sales. Further assistance is provided by Nick Browne, Alasdair's brother in law, who has done much of the work on converting the 'Old Carpenters Workshop' into a brewery. Alasdair spent 20 years in the army. He has used the brown, green and red colours of his regiment, the Royal Tank Regiment, as the colours for the bands painted on the brewery's casks to distinguish them from those of other breweries. He had done some home brewing while based in Edinburgh and for the last couple of years while he was in the army he would spent weekends at breweries, doing odd jobs and finding out how everything worked. He also completed the Brewlab training course at the University of Sunderland. They first entered what is now the brewery on June first, 2006. It is located some 18 miles to the west of Salisbury, on a rural business park set within the Fonthill Estate. Its previous use as a store for game meant that it already contained a large cold store. The first brew was on June 28th that year but unfortunately there were problems with the boil so it just became a learning exercise. Since then, though, there have been no brewing or the equipment problems. As far as possible, the brewery produces its beer using local products. All the malt is purchased locally from Warminster Maltings. In February the first delivery was taken of barley that was grown 300 yards from the brewery door and then malted at Warminster. All hops are grown in the UK, in Kent, Herefordshire and Worcestershire. This does mean that Alasdair is unable to use some varieties that he is keen on, such as Cascade, as none are currently available from UK growers. The water, or liquor as it is known in the brewing industry, is sourced direct from a borehole. The yeast used to come from the nearby Hop Back Brewery but now they propagate their own. As mentioned above Nick Browne is much involved with the construction of the brewery. His main job involves solar panels, so now there are solar panels on the roof of the brewery which help to heat the water for brewing in the summer. Even with less sun in the winter months the panels do mean that the water is some 15 degrees warmer than it would be otherwise. To the beers. The best bitter, and the first beer brewed, is Large One, which has an abv of 4.2%. This is the brewery's best selling beer. Cornerstone, at 4.8%, is mainly a summer beer while Cheer Up (as in, 'Cheer up the days are getting longer!') is available between December 21st and June 21st. The 4% abv Gold Standard is brewed using Boadicea hops and the same recipe with added ginger is sold as Gold Spice. The brewery's Porter is 4.5% on draught but 5.5% when bottled. Occasionally the stronger version can be found on draught in pubs where Alasdair knows it will be appreciated by discerning drinkers. In addition to Porter, Large One and Gold Spice are also bottled. The bottled beers have won a number of awards but contribute to just five percent of production. There are also seasonal beers in the brewing schedule, including Wiltshire Pale Ale and Solar Brew. The beer is brewed on a ten barrel plant with four ten barrel and two five barrel fermenters, quite small in the new micro-brewery spectrum. While Alasdair would like to expand production, he has no wish to expand to the extent that the brewery outgrows the current premises. He wants to keep control over both production and where the beer gets sold. Therefore there are no plans to use wholesalers to distribute the beer. Most of the brewery's customers are community pubs, which is how Alasdair likes it. The trading area is bounded by Southampton, Bath and Swindon. The two pubs in our area where you are most likely to find Keystone beers are the Guide Dog in Southampton and the Royal Oak in Fritham. But why Keystone Brewery? Alasdair said that choosing the name was one of the more difficult decisions that had to be made when setting up. The name Keystone was inspired by the carved keystone in the archway that is located on the estate and is known as the Fonthill Arch. Most Hop Press readers live near enough to the Keystone Brewery that they are likely to come across one of their beers in a local pub. Perhaps, in the future, the brewery may become more famous on a national scale if a television company ever decides to produce a 'How Green is my Brewery' series! The Editorial in this edition has already welcomed a new star in the Easteigh firmament, the new Wetherspoon's outlet, the Wagon Works that has opened in the former Home Tavern following a massive £640,000 refit. Another pub that is again serving customers following a lengthy period of closure is the Ship Inn, which featured on the cover of the last edition of Hop Press. It reopened in November, having been closed since May, and is being run by Scott Garner and Alberto Costellone, who also manage the Chase Inn at Waltham Chase. Nearby in Lower Upham, the Alma is now trading as a Crown Carvery. This was the 101st opening by the national chain which is part of Mitchells and Butlers. On the chain's website, when looking for the nearest Crown Carvery one is able to narrow the search to those establishments that have Sky TV, Setanta Sports or a quiz night. Some readers may wish to use the facility to identify outlets with or without one or more of these features. The Haywain at Bartley underwent a similar conversion late last year, having previously been, like the Alma, a Brewers' Fayre and then an Innkeeper's Fayre eatery. The Prince of Wales at Shirrell Heath reopened in November after a major refurbishment. A good selection of real ales was on offer when we visited the pub. Owners Admiral Taverns spent £130,000 on the revamp, while licensees Grace and Drew McCartney also invested £30,000 on the project. A further £150,000 was invested by Admiral Taverns on the Hyde Tavern in Winchester. The gas fires have been replaced by log burning fireplaces and the original floorboards have been uncovered. Two features that remain are the undulating floor and the unusual gents urinal. A number of beers are now served straight from casks behind the bar in addition to those from the bank of three hand-pumps. Almost opposite the Hyde Tavern work is at long last progressing on converting the former Prince of Wales into homes. It is more than five years since the first planning application for the scheme was submitted and even more since the pub closed. Another former pub site, lying vacant for five years, is in Weeke. Chimneys closed in February 2004 and the pub was demolished in 2005. Now, following five rejections by council planners and two public enquiries, an inspector has given permission for an Aldi supermarket to be built on the site. Will there be as much delay at the site of the Stanmore Hotel? Despite a vociferous campaign from locals, the last pint was served in the early hours of 2009 at a New Year's celebration attended by some 150 customers. Although the planners refused plans to use the site for a 56 bed care home, this was reversed on appeal last autumn. Campaigners wanted to challenge the decision but the cost was prohibitive. Colten Developments have suggested that it might be some time before the care home is built. Despite this doom and gloom about pub closures, some are still thriving. An application has been made for single storey extensions to the Running Horse at Littleton and on Winchester's other side, the Percy Hobbs reopened late last year. 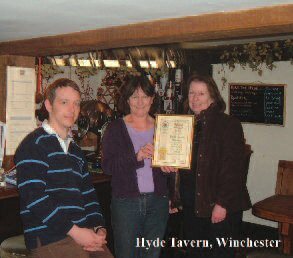 Licensees Simon and Angela Goulding are keen to use local produce where possible in contrast to previous times when the pub was part of the Brewers' Fayre chain. The couple were previously at the Thomas Tripp in Christchurch. Another former Brewers' Fayre outlet has not faired so well. 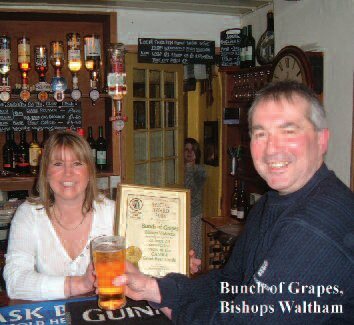 We reported in the last Pub News that the Captain Barnard in Compton had been closed by the owners Mitchells and Butlers. Plans to also use this site for a care home, with four detached houses, were rejected by Winchester planners. An appeal by developers Highwood Residential was heard on 26 March and the decision is immanent. The history of other local appeals makes success all too likely! Yet another former Brewers' Fayre establishment that is now operating under new colours is the Windhover Manor . At the end of October it reopened as a Harvester, another Mitchells and Butlers brand. The Brewers' Fayre brand is still owned by Whitbread. The only remaining outlet in our area is the Silver Bells in Hordle. It reopened last December together with the adjacent Premier Inn, another Whitbread brand. Potential customers may have some trouble finding the pub in the dark as New Forest planners refused permission for a variety of large illuminated signs. Whitbread have appealed against this decision. While the pub/restaurant chains change hands for millions (though fewer millions now than a few months ago! ), one New Forest publican was offering the lease of his pub for just a £10 raffle. The chance to own the 20-year lease of the Filly Inn at Setley was announced in November. The website where the scheme is described (www.win-pub.com) is still up and running but there is no information on when the draw may take place. There have been many concerns over the legality of this and similar schemes where individuals try to sell their homes. At the very least the announcement of the plan gave the pub front page publicity in the Daily Echo . We reported in the last Pub News that the Smugglers Inn , Milford-on-Sea had closed for the second time in a year. It reopened again in October and is now being run by the same family that run the Hare and Hounds at Sway and the White Hart at Pennington. Just up the road in New Milton the Old Barn is under new ownership and management. The emphasis is on the restaurant and accommodation but real ales are available from the bar. 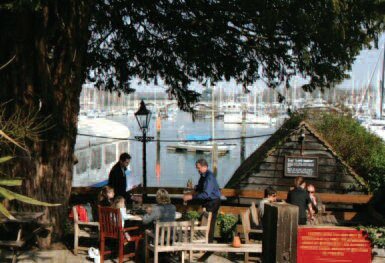 Another establishment that is now offering accommodation is the East End Arms , to the east of Lymington. Five en-suite bedrooms are now available for guests. Drinkers will again be able to get refreshment in historic Buckler's Hard after the Master Builder's House reopened at the end of March following refurbishment. It is now being leased by Hillbrooke Hotels, who also run establishments in Longleat and Pangbourne. In the last edition of Hop Press we looked at the possible demise of the traditional pub sign. Fortunately there are some breweries who still appreciate such traditions. Devizes brewers Wadworth are the only brewery to keep its own in house painting shop. When a new sign was being painted for the Gamekeeper in Woodlands, near Ashurst landlord Mark Thompson suggested that his dog Charlie could be the model for the dog on the sign. The brewery agreed and so the new sign features cocker spaniel Charlie in the traditional country scene. Continuing east, the Anchor Inn , Eling reopened in March under new management and with a new restaurant. Also under new management is the William IV in Romsey. Sylvia and Martin Finch and their daughter Adele have been running the Star Inn in the town for over a year and since the end of January Adele has also been running the William IV, in partnership with her parents. Late last year the Sun Inn in Romsey also had a change of licensee. 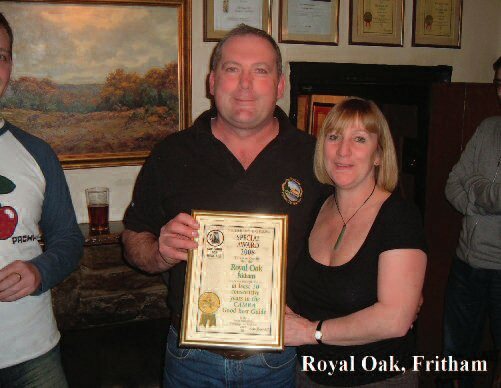 Previous pint pullers Liz and Steve Stephenson have retired after 18 years. The lease was taken up by their chef, Paul Wilson and his wife Ann. 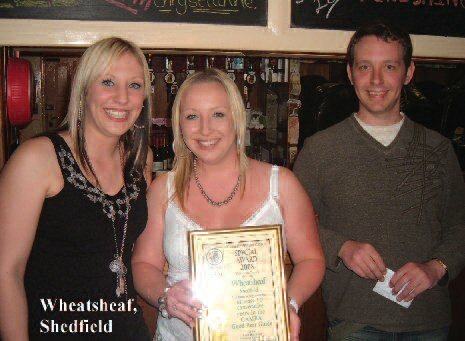 Finally, the Old House at Home was the winner of Fuller's Town/Local pub of the year for 2008. 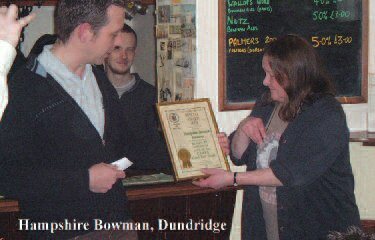 The award was presented to licensees Michael and Sarah Edom. The end of January produced a very sad day in the village when the 26th saw the death of Bernard Cook, the very long-serving landlord of the one-time Gales, now Fullers, Newport Inn. The parish church of All Saints was completely swamped as what seemed the entire village turned out for the funeral. Our deepest sympathies go out to Bernie's wife, Janet, who is continuing to run the pub. Another local Fuller's pub is looking to expand its trade by the addition of 38 hotel rooms. An application has been made to construct the rooms based on the outbuildings that currently stand to the rear of the Fleming Arms, Swaythling. Nearby, just over the Itchen, the White Swan at Mansbridge reopened at the end of March, having yet again been flooded when it was more in the Itchen than on its banks. It is badged as a 'British Free House and Carvery,' which is part of a chain of some 40 such outlets run by The Orchid Group. There was a different type of emergency needing evacuation at the Bugle in Hamble recently. This time it was fire that forced customers out but fortunately the small fire in a storage cupboard was out by the time fire fighters arrived. Drinkers are unlikely to ever return to the Station pub in Netley however, which has been boarded up for many months. Permission has now been sought to demolish the pub and build 14 homes, a shop and offices on the site. That is just one of the many pub closures that have been attracting a lot of publicity in the local and national press recently. While the actual numbers being quoted have been questioned by some, there does seem to be an increase in both the number of pubs that have permanently closed and, perhaps more significantly, the number of pubs that stand empty for many months. One such closure is the Grapes in Southampton's Oxford Street. Licensees at the time in January, Jacqui and Trevor Nesbitt said that trade had reduced from 3,000 pints a week in 2007 to just 830 at the time of closure. They then pointed out that the recently opened Wetherspoon pub, the Admiral Sir Lucius Curtis was selling Greene King IPA for 99p a pint while they were having to buy their beers from Enterprise Inns for £1.57 a pint. Nearby, the Dolphin Hotel with its large, High Street facing bar went into administration at the end of last year. The owner Bob Musker said one of the primary causes was the refusal of planning permission to build 87 flats on the hotel car park. One move that pub owners try when trying to revitalise a pub is the change of name. One recent example is the Fitzhugh in Milton Road which, not as the result of some missing letters, is now called The Fitz. The licensees of Kolebka decided on a more radical method when they decided to change the name of the pub, they held a competition. The new name is the Shooting Star. We wonder if this new name will last any longer than some of the previous incarnations which, since 1996 include Buskers, Festy O'Malley's and Legends. Since the last Hop Press Hampshire has lost a fairly long-standing brewery but has also gained one and is just in the process of gaining another. The Hampshire Brewery on the Greatbridge Industrial Estate in Romsey brewed its last pint at the start of the year and has closed with the loss of 13 jobs. The brewery started in 1992 at a site in Andover, moving to Romsey a few years later, re-establishing a tradition in the town that had been lost by the break-up of Whitbread. Several notable beers have gone with their collapse, for example the Strongs Best Bitter which was a re-creation of an original Strongs brew from the 1960s; it would be nice to hope that another local brewery might perhaps buy the rights to the recipe and produce the beer again. The Pride of Romsey, their 5% premium bitter, perhaps the best regular brew, will also be missed and in a sense another 'brewery' went down with them as they were contract brewing Laverstoke Ale for the Jody Scheckter Laverstoke Park Farms enterprise. Reasons for the demise are hard to pin down but there is certainly a feeling that, recently, they had somewhat lost their way, producing too many seasonal and occasional brews and bottling too many varieties. There had also been some quality issues, especially with some bottled beer batches. We also understand that the unit rental for the premises was high for the size of building. Whatever the reasons, it is virtually a certainty that brewing will not come back to this industrial estate. There is much brighter news however from the other end of the county. From Lodge Farm in North Warnborough (near Hook) to be exact. For it is here that the Andwell Brewery has been set up by Adam Komrower. Finally, also in the east of the county but this time towards the south, we are about to have a new brewery start-up in the shape of the Havant Brewery . Mike Charlton of Cowplain has set up a one-barrel plant in the garage of his home. The excise license was granted at the end of March and the first brew(s) should have appeared by the time you are reading this. Three beers are in plan at the moment: Started , Finished and Stopped Dancing but details of their intended characteristics are, as yet, not available. We hope to have beers from both of these breweries at the forthcoming Southampton Beer Festival (May 28th, 29th and 30th, at the Guildhall). See the Southampton Beer Festival pages on this website for more information. Prizes to the first two correct entries drawn. Closing date: 20th July 2009. Perhaps a bit easier, this puzzle attracted over twenty entries. However 10 across caught several out, I couldn't accept OPAL. I did, however (generously!) allow GREYISH for 19 down although it doesn't quite fit the clue. Also LEGENDRY worried some; although it means a collection of legends I think the clue just about covered it. 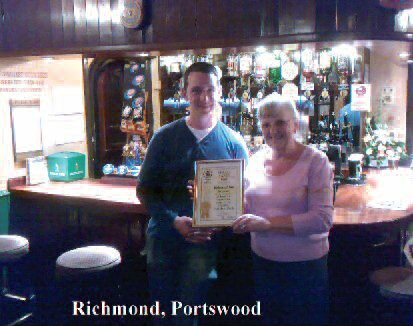 We were very pleased to receive this article from the Ringwood Brewery — it would be good to get more such from within the trade. It's been almost 2 years since Marston's took over the helm at Ringwood and no-one could have predicted just how much they would have enhanced the business. In 2007, the brewery was producing 33,000 brewers' barrels which by any brewery's standards is high but by March 2009, a mere 18 months later, production is up by over 15%. Best Bitter, Fortyniner and Old Thumper are now travelling far and wide as well as the seasonal beers which have increased from 4 a year to 6 in order to give customers more choice from the Ringwood range. Bold Forester is out at present with Seventy Eight back by popular demand for May and June and a new beer, Filly Drift, is coming out in September. Substantial investment has been made in the site with a new malt handling plant and boiler as well as a new Porteus Mill which was opened by the Mayor of Ringwood at the brewery's 30th birthday celebrations in September last year. The quality of the beers has been enhanced as a result of the changes with better extracts and further investment is planned to increase capacity with additional fermentation tanks. A further development was the integrating of Marston's Totton Distribution Centre and the Brewery to form a Southern Distribution Centre. For months the two sites had been working 16 miles apart delivering beer, ringing customers and managing warehouses but they are now under one roof. The integration has meant more staff working out of Ringwood, new vehicles and of course, a wider distribution area with beer being delivered from Torquay all the way over to Brighton. Ringwood is still as committed as ever to the local community with farmers' markets, charity events, local food festivals, the New Forest Show and beer festivals very much a part of the brewery calendar. Ringwood also ran some exciting Cask Ale Week events which included free brewery tours during that week as well as the chance for 35 women to come along and have a 'Ladies Night' at the brewery with a tutored tasting of the beers and a 'Beer and Chocolate' tasting session before taking home a goody bag! Invitations have been extended to all local CAMRA branches to visit the brewery, please contact your local secretary for details and we look forward to showing you the new developments! The new Filly Drift will be a powerful 4.7% abv brew, tending towards the 'golden ale' style, the detailed recipe is still being honed. Secondly, we can allay any misgivings that a few licensees had expressed on seeing Ringwood beers arrive in casks from other Marston breweries. This is a symptom only of success — brewing exceeding the immediate cask supply logistics! Bursledon is an unusual and easily identifiable place, with a quiet and unspoilt feel because of its isolation. If you look at a map you may see what I mean. Bursledon is bounded on the east and south by the River Hamble, on the west by an unnamed stream flowing into the Hamble, and on the north by the A27. 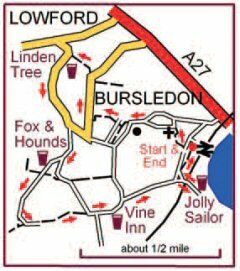 Bursledon also has an unusual collection of pubs: the Fox & Hounds, Jolly Sailor, Linden Tree and Vine Inn. Just as one of the prime delights of real ale is its variety, so it is with these pubs; none of them could possibly be mistaken for any other. Here, in an area of about a square kilometre are four good examples of the family of English Pubs. Start from Bursledon Station Car Park Most unusually, and sensibly, the station car park is free. Has a deal been struck between the railway and the council to reduce parking on the narrow local roads? This car park is also the recommended parking for The Jolly Sailor, the last pub on this walk. Whatever, it makes for a very sensible place to start the walk. Leave the car park and turn left into Station Hill, just before the barriers which stop this very narrow road being used by through traffic, turn right onto a narrow footpath between properties. Go uphill and bend right around a grassy green bowl. Turn right at a Strawberry Trail sign (straight ahead are steps up to Bursledon Church) and continue uphill and left around the churchyard. Turn left into Church Lane and continue past the church with cemeteries on both sides. At the T-junction turn left into Hill Place past a garden with a good display of conifers. Continue gently uphill, soon to reach a gateway on the left for Greyladyes Mausoleum. The Mausoleum is worth a short visit, though the once fine views are now reduced by tree growth. Leave the Mausoleum by the top gate, and cross the road to a rising zigzag path. At the top, bend left, then turn right at another Strawberry Trail sign, past another small cemetery. Sorry about all these cemeteries, this really is a nice walk. I guess it's just that a lot of people liked the notion of being buried here. For me, I'll enjoy it while I'm living. Don't worry we'll get to a pub soon; those of you that know me know I like a bit of a walk to get a thirst on. Cross a small tarmac track onto a path with a large grassy field on the left, and continue left around this field to Great Down Park car park. Here turn right into Long Lane, one of the busier roads, but with a good footpath. Go past Bursledon Infants School, then where the road bends right, carry straight on downhill on a footpath between houses. The path bends left and continues downhill, with Lowford below you on the right. Eventually turn left into School Road and just ahead is the Linden Tree. 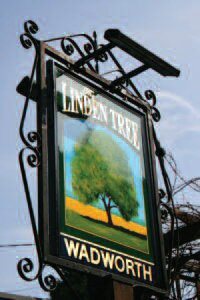 (Wadworth Pub, at least three Wadworth beers, open all day, 'phone: 02380 402356) The Linden tree is a good community pub, perhaps more for Lowford than Bursledon. There is an attractive sheltered front balcony overlooking the lane, including a glass panelled area for smokers. On leaving the pub, turn left uphill. Although this is one of the busier lanes on the walk and has no footpath, it is still pleasant enough to walk along as it twists gently uphill. Just before the road levels, fork right gently downhill into quiet Kew Lane, and soon fork right again into even quieter Hungerford, a cul-de-sac leading to Hungerford Bottom. Ahead is what looks like a very small white house, this is the Fox & Hounds. (Chef & Brewer, open all day, food all day, beers on when visited: Courage Best, London Pride, Hogs Back TEA, Ringwood 49er, 'phone: 02380 402784) However, first impressions are deceptive: some years ago a large barn was moved here from Winchester; and the house, the barn, and a linking building make for a very substantial, popular establishment. On leaving this pub, turn right towards Hungerford, originally a Victorian hamlet, now an equally attractive peaceful residential area. Continue on the narrowing tarmac road, keeping left when possible. Eventually you are confronted by the drive of the Coach House; on the left and parallel to the drive is a small footpath taking you through a short stretch of countryside. This path takes you uphill and out onto a bend in Kew Lane. Continue straight ahead, immediately to pass the Salterns Lane cul-de-sac. This lane leads down to a couple of short footpaths giving views of the Hamble. 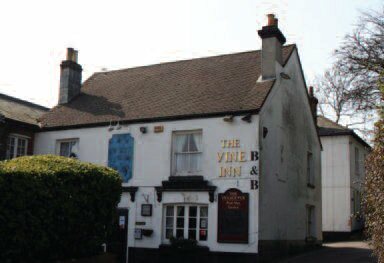 But, continue straight ahead into High Street and very soon you come to the Vine Inn. (Greene King IPA & Abbot straight from the cask, limited opening hours: 5.30-11 Mon-Sat, plus 12-2 Fri, and 12-4 & 7.30-10.30 Sun., B&B, 'phone: 02380 403836) As the sign on the pub wall says, this is the village pub. Indeed it is: run by a villager for the village. Whenever I have visited I have enjoyed the friendliness of both the Landlord and the customers. It has the atmosphere of a social club looking for new members. I agree with drinkers more expert than me who say that the beer is exceptional too. On leaving the pub, turn right, downhill, soon to pass the Old Post Office. At the fork keep right, still in High Street, past a viewpoint with a bench and good views across the lower Hamble and Solent as far as the Isle of Wight. Continue down this most rural High Street, which then starts to climb again. Ignore Station Hill forking off left, and keep right across a railway bridge into Lands End Road, another cul-de-sac. Immediately the sign for the Jolly Sailor is visible ahead, but not the pub. That is down at sea level, reached by a long flight of steps from the sign. If you continue ahead to the end of the car parking area there is a second and less steep access to the pub. 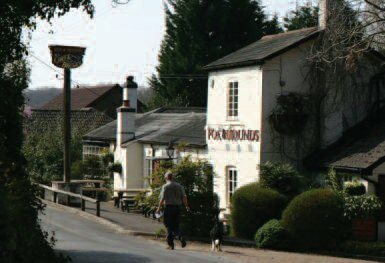 (Hall & Woodhouse, open all day, food all day, 'phone: 02380 405557) This pub is perhaps the best known in Bursledon; it came to fame in the 1980s in the BBC's Howard's Way series, which was filmed on the Hamble. Indeed, by far the best way of getting to this pub is by water: the pub has its own covered pontoon for that purpose. As expected, the pub has good views of the Hamble and the nautical activities thereon. On leaving the pub, from either stairway, turn right along Lands End Road back to the railway bridge. (A short excursion left and downhill along Lands End Road will bring you to the water's edge again.) After the bridge keep right, very soon to join Station Hill, then immediately fork right onto a steep downhill path leading back to Bursledon Station. Your walk is now complete, I hope you found it a worthwhile circuit of this quiet Hampshire backwater. Maps: The relevant OS 1:25,000 Explorer Map is OL22 - New Forest, which is a very useful map to have, covering the coast from Bournemouth to the Hamble. It is one of the few double sided OS maps, so is particularly good value. Parking & Public Transport: This walk starts from a station car park; I hope you will use the train to get there, but many buses also serve: 72, 78, 79, 80 and 80A all run along the A27, close to the station. Distance & Times: The complete walk is a little over 2 miles, which could take as little as 45 minutes. Of course your time will largely depend on how many pubs you visit! But note the restricted hours of the Vine; to enjoy it means an evening, a Sunday, or a Friday lunchtime walk. Photographs: Our thanks to Bryn Massey for the pictures included. The dire state of Britain's pubs, as a result, immediately, of the global financial chaos but intrinsically because of the disastrous long-term effects of the 'Beer Orders' introduced in the 1980s by the Thatcher regime, has been high-lighted in a report to Government prepared by the GMB union. The 'Beer Orders' resulted from an MMC (Monopolies and Mergers Commission) investigation into the brewing industry, stimulated by concerns over the growing power of big, national brewers — then colloquially known as the 'Big Six.' It was generally recognised that unless something was done, the Big Six would become five, then four and so on with unacceptable increase in market monopoly. The key recommendation of the MMC was that no brewer should be allowed to own more than 2500 'tied' pubs. This could, perhaps, have worked but at this point Lord Young, a Thatcher minister, intervened to alter the wording so that the 2500 limit only applied to companies also owning operating breweries — in one bound the Big Six were free! By separating brewing and pubs into legally independent entities and then establishing supply agreements between the brewing companies and the 'pubcos' as they became known, their former power could be maintained. Unfortunately, in the context of the present financial situation, the pubcos were set up by establishing huge, international loans which were 'securitized' on the basis of the longterm rental income. This capital debt was truly vast, the two biggest pubcos, Punch Taverns and Enterprise Inns have a combined obligation between them of £8.5 billion. Most of this was established at fixed rates of 6% or so, meaning that just to service their debts these two companies must produce £730m per year which is equivalent to £50,000 per pub per year! Just like our greedy bankers, who thought the good times would roll forever, the pubcos have been caught out by the over-leveraging of securitized debts. None of this is much comfort to the hardpressed pubco tenant who has to pay up to 80p per pint over the normal wholesale price of his beer just to syphon off to an offshore bank. Pubco tied pubs have reached breaking point — well over a thousand have closed in the last three years. Even with the evidence before them, the pubcos blame everyone else but themselves for the results of their own greed. Even in the past few months, with inflation about to go below 0%, Enterprise Inns have just slapped another 6% increase in beer prices on their unfortunate tenants. 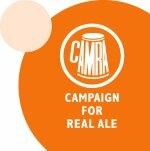 The GMB's report was prepared in support of the Fair Pint Campaign, a lobby group set up by pubco tenants (and supported by CAMRA) to campaign for fair terms for tenants. The evidence in the report is being submitted to the All Party Parliamentary Beer Group (APPBG) which is currently looking into the state of the licensed trade. Whether the APPBG sense the urgency of the present situation is something of a moot point, but Liberal Democrat MP Tim Farron (Westmorland and Lonsdale), is leading the fight for fair terms.